The year was 1917 and the Australian 49th Battalion was fighting for the Commonwealth Forces on the Western Front. The battle was raging just outside Ypres in Belgium and two brothers fought side by side against the might of the German army. 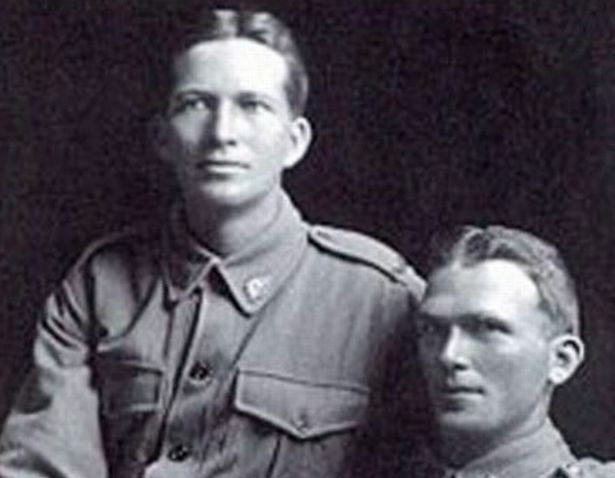 Their names were Jim and John Hunter from Nanango in Queensland. The brothers had been in battle before so they knew the risks they were taking as they attacked the German lines and for the first time on the Western Front the tide was turning as the strength of the Aussie attack finally had the Germans wondering how for the first time in the war as they were losing because of the Australian efforts. The battle was furious and the ground was covered with broken and mutilated bodies, dead animals, mud and disused army equipment amongst the smell of dead and the screaming of wounded soldiers from both sides. The Aussies were eventually triumphant under the leadership of the great Australian general John Monash but at a huge cost and in this battle of Pozieres alone there were thousands of Aussies being blown apart by the German artillery to the extent where there would never be even a simple headstone to remember them by. In the midst of this nightmare of a battle, John Hunter was killed and his heart broken brother had little time to think what to do with his body but wanted him buried so he could find him later. He wrapped him tightly in an army issue groundsheet and buried him on his back as if resting peacefully in the field of battle. He returned later after the battle had moved on but could not find the body and John remained in his grave as the war continued over him towards the inevitable Allied victory. There was to be no gravestone for John, and Jim Hunter had to return to life in Queensland without ever knowing what happened to the body. He lived a full life and one of his grandchildren eventually visited the battlefield where they fought in June 2014. In May of 2014 my brother Rod Murphy, my son Beau and myself had decided to retrace some of the journey of my father John Murphy in World War 2 and we travelled to Egypt and Greece where his 2/5th battalion had fought. Our father had spent 1286 days overseas during WW2 and we have great respect for his achievements and the four years he gave so that we could live the life we have in Australia today. Both of my sons have joined the army and were proud to be in the military service due to his influence and my brother Rod has served in East Timor and Afghanistan. We also visited Gallipoli in Turkey to honour the ANZACS who fought there in WW1 and then flew to Western France and Belgium to look at the Western Front battlefields as it was the centenary of WW1. The Western Front tour was quite different to Gallipoli in that the Turks looked at the Aussies as invaders and even though our men fought bravely and their resting place in the memorial gardens are well kept by the Turks, it did not compare to our feelings of pride on the Western Front. The French are so appreciative of what the Aussies achieved on the western front and freely admit that we turned the tide of the war, a war which many wondered would never end. The village of Villers-Bretonneux in France for instance where the local school (which was rebuilt from donations from Australia after the Great War) has a museum attached which is full of information on how the Australian soldiers saved them in WW1. The Federal government has recently spent a dew million upgrading it. The school yard has a permanent sign still one hundred years later stating “Don’t Forget Australia” and the Aussie flag is in every classroom. We visited many of the memorial graveyards across that vast area and walked over the fields that they had given their lives 100 years ago. Near the Menin Gates in Belgium we despaired at the numbers who died there from all countries involved in the battle of Pozieres in the fields of Flanders but for such a young country as Australia that had only gained Federation 13 years before it was devastating. My brother in particular was overcome by the number of 49th battalion soldiers who were buried there (as he is an ex-army Major and once served in that battalion) and the tens of thousands of names on the Menin Gate walls for the ones who were never found. Whilst touring the area our guide asked us if we wanted to see some old film of the Aussies in the area and took us to the Polygon Woods pub where we met a Belgian gentleman by the name of Johan Vandewalle who worked there but was also responsible for the exhuming of any remains of soldiers who were found fairly consistently in the area. He is an expert in the local battles as he has lived in the area all his life and is devoted to the history of it. 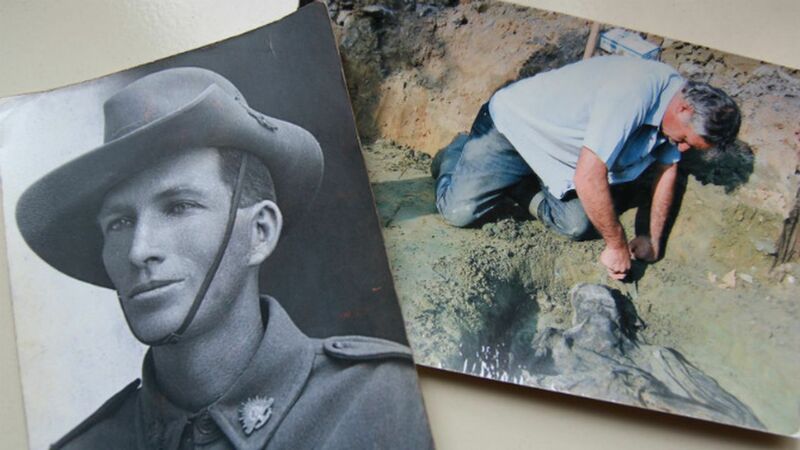 He told us of the story of Jim and John Hunter and how in 2005, some 89 years after John was buried, a backhoe digging for a new pipeline whilst widening a road unearthed his body and those of some of his comrades. Johan Vandewalle was called to the site known as Zonnebeke and on arriving started to dig out the soldiers remains- all five of them to be known as the Zonnebeke five. One of the bodies was very well preserved and he had found the body of John Hunter still wrapped in his groundsheet with the body outline clearly visible. As he slowly dug away the surrounding dirt covering the site he was confronted with John’s body which was still intact and he commented on the tallness of the soldier and his square jaw which made him so life like. 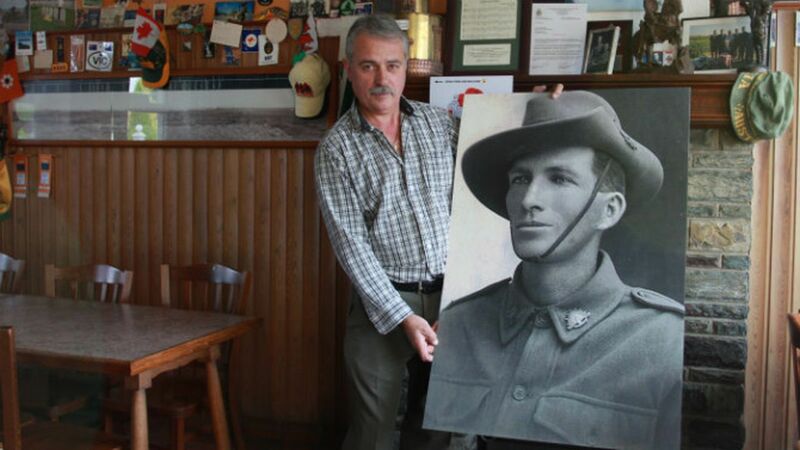 He became very moved by this soldier and his background and started to unravel his history. The soldiers were reburied with full military honours in 2007 as Jim would have wanted for his brother all those years ago.